An updated edition of a guide to the basic science of climate change, and a call to action. The vast majority of scientists agree that human activity has significantly increased greenhouse gases in the atmosphere--most dramatically since the 1970s. Yet global warming skeptics and ill-informed elected officials continue to dismiss this broad scientific consensus. 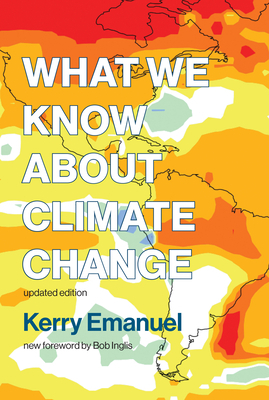 In this updated edition of his authoritative book, MIT atmospheric scientist Kerry Emanuel outlines the basic science of global warming and how the current consensus has emerged. Although it is impossible to predict exactly when the most dramatic effects of global warming will be felt, he argues, we can be confident that we face real dangers. Emanuel warns that global warming will contribute to an increase in the intensity and power of hurricanes and flooding and more rapidly advancing deserts. But just as our actions have created the looming crisis, so too might they avert it. Emanuel calls for urgent action to reduce greenhouse gases and criticizes the media for downplaying the dangers of global warming (and, in search of "balance," quoting extremists who deny its existence). This edition has been updated to include the latest climate data, a discussion of the earth's carbon cycle, the warming hiatus of the first decade of this century, the 2017 hurricanes, advanced energy options, the withdrawal from the Paris climate agreement, and more. It offers a new foreword by former U.S. Representative Bob Inglis (R-SC), who now works on climate action through his organization RepublicEN. Kerry Emanuel is Professor of Atmospheric Science in the Department of Earth, Atmospheric, and Planetary Science at MIT. He is the author of Divine Wind: The History and Science of Hurricanes and Atmospheric Convection. In May 2006 he was named one of Time magazine's "Time 100: The People Who Shape Our World."